Harshbarger Law Firm, formerly JD Law Firm, P.C., located near Whitehall, Montana, serves clients throughout Southwest Montana, including Madison, Jefferson, Beaverhead, Silver Bow, Gallatin, Deer Lodge and Powell counties, and cities such as Twin Bridges, Whitehall, Boulder Butte, Dillon, Anaconda, Deer Lodge and Bozeman. The firm assists clients in numerous legal practice areas, including family law, estate planning, elder law, real estate, business, agricultural law, and select personal injury and wrongful death. We see our firm as one that clients can turn to for help, during many of life’s challenges and events. Our law firm goes beyond helping clients with their legal issues. We are a “Law Firm for Life,” often working with clients through varying stages of their lives, sometimes for many generations. We focus on partnering with each client. When representing our clients in difficult situations, this partnership often facilitates the healing process, so they can move forward. Taking the time to really listen to our clients’ concerns is important to us. Having diverse experience, our office is a one stop firm for assisting clients with most of their legal issues, including prevention, problem solving, planning, coaching and resolution of disputes through litigation, mediation or collaboration. We work closely with each client to come up with a personalized plan of action that preserves their rights and best interests while incorporating their unique values and goals. Our office understands the importance of family and community. Our firm’s attorney, Lori Harshbarger, grew up here on her family’s ranch and she chose to come back to raise her own family. 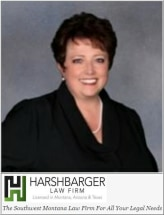 She applies over 20 years of legal knowledge and experience to every case. It is important for clients to be able to work with a lawyer who they can count on and trust. We have worked hard to build up a reputation that does just that. Harshbarger Law Firm is not just here for the legal problems you are facing today – We are Here for Life.